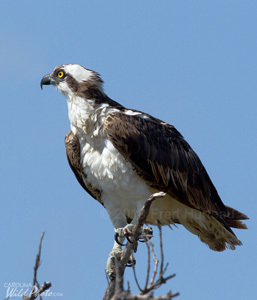 If you have a hankering to go photograph birds at Estero Lagoon in Fort Myers Beach, Florida, you will likely find it bewildering trying to reach the actual lagoon for the first time with your camera gear. All the obvious paths are posted "Private Property, No Trespassing", so you will have to go a little bit 'round about to get there... unless you get a room at one of the swanky "Private Property" locations blocking your path. Or, you could get a room at the Wyndham Garden Hotel, 6890 Estero Blvd., located at the north end of the lagoon. If you're just coming for the day, then here's how to park and reach the lagoon. (1) Reach Fort Myers Beach. I went in March of 2019, arriving from the south end and had no issues. But when I left I made the mistake of going north. The only road through the island (Estero Blvd.) was torn up/under construction north of the lagoon. It took me 50 minutes just for the 5 mile drive to get off the island instead of the 10 minutes it should have taken. The lagoon is at the south end of the island anyway, so save yourself the traffic issues by coming and going via the south end through Bonita Springs on Rd. 865/Bonita Beach Road SW.
(2) Park your car in the Santini Marina Plaza Shops strip mall parking lot at 7205 Estero Blvd. (GPS coordinates N 26.414383° W 81.899992°). It's public and free, and there is a handy Subway Restaurant at the north end of the parking lot if you need a restroom, or a bite to eat. This parking lot is directly across the road from the lagoon, but you cannot get there from here. Everything between you and the lagoon is private property, and posted. (3) Grab your gear, then walk north on the sidewalk along the east side of the road (same side as the parking lot) for 800 feet to the cross walk in front of the Wyndham Garden Hotel at 6890 Estero Blvd. (GPS coordinates N 26.416499° W 81.901302°). Cross at the cross walk with the pedestrian light - traffic can be unkind otherwise. Then walk through the Wyndham's parking lot westward to the lagoon and beach behind the hotel. At this point you are at the north end of the lagoon and can start exploring from here. To reach the beach side go on to step #4 or #5. (4) Turn south and follow the obvious foot path that runs between the lagoon and the buildings for about three tenths of a mile to the far south end of the lagoon where you can cross over to the beach front. (5) Alternately, you can go from the hotel around the north end of the lagoon out to the beach front and then walk south along the beach toward the southern end of the lagoon. I did not go this way, but I see no reason you can't choose that route. I recommend looking things over on Google Earth to familiarize yourself with the location before you go. 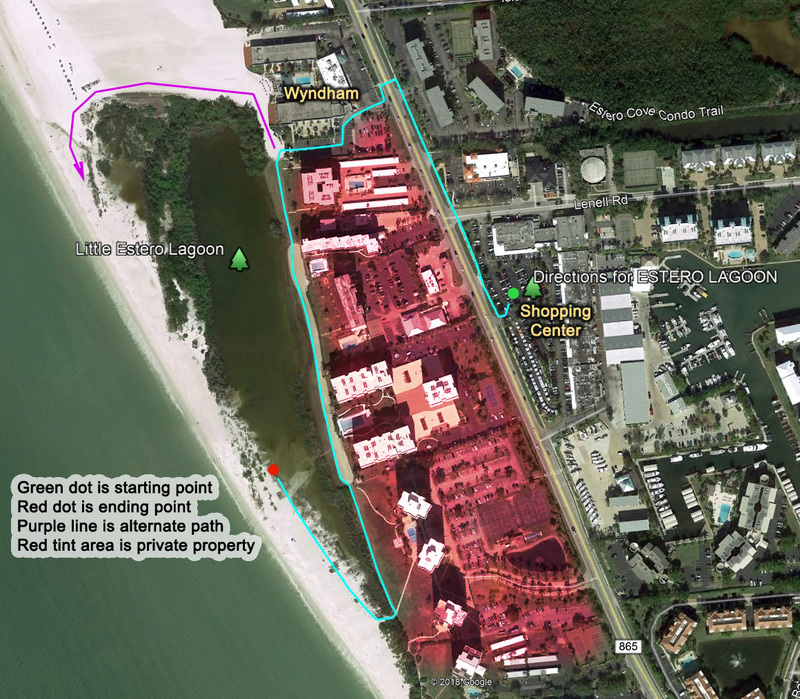 I have drawn a path overlay for Google Earth showing you exactly the path to walk from the parking lot to the lagoon to avoid the "Private Property" issues. The ".kmz" file only works for the desktop/laptop version of Google Earth. The portable device version of Google Earth doesn't have this feature. Near the south end of the lagoon where the water is shallower there are a couple of places where you can wade across (barefoot or with suitable water footwear of course) to shorten the walk. You will spot these shortcuts where the vegetation along the lagoon edge has an obvious break with a worn footpath. Otherwise go all the way to the end as shown in the Google Earth path file to reach the beach side of the lagoon. To be honest, I didn't have much luck finding birds at the lagoon, but I was there in the mid-afternoon. Early morning or late afternoon is best according to all the references/reports I've read from other photographers. The water level in the lagoon may have an effect as well. All I found were three White Pelicans, three Brown Pelicans, one Osprey, a couple of Cormorants and a lonely female Mallard - nothing I couldn't have found in North Carolina. No Spoonbills, or Wood Storks, or Reddish Egrets - very disappointing.